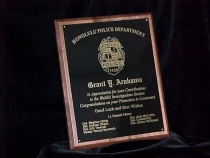 Laser engraving on black brass is our most popular Laser product. Class, style, and a richness you have to see to believe. tones of solid brass shining on a black laquered background. Other laquer colors are also available.